Give a suit. Change a life. Atlanta Center for Self Sufficiency is one of the recipients of the Men’s Wearhouse National Suit Drive, which officially kicks off today. 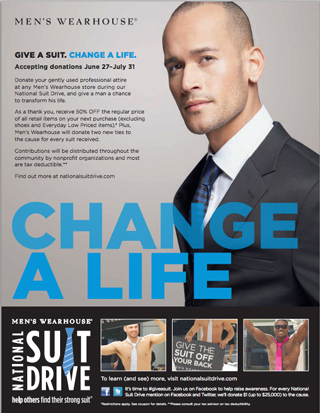 Donate your gently used professional attire at any Men’s Wearhouse store between June 27 and July 31. You’ll be helping someone in need dress for a job interview or new employment. And, as a thank you, Men’s Wearhouse will give you 50 percent off most items in the store. Visit nationalsuitdrive.com for more details. We’d like to thank Men’s Wearhouse for its ongoing support of ACSS. That support is one reason ACSS’ clients are not only among the best trained job applicants, but also the best dressed! Tee Up with fellow business and community leaders to join the fight to tackle homelessness! Play golf, win prizes, and enjoy lunch and dinner in support of Atlanta Center for Self Sufficiency’s mission to empower homeless individuals to achieve economic self sufficiency and their ultimate potential to thrive in life. The number of men and women experiencing homelessness is increasing daily. Your participation supports men and women who are ready to break the cycle and leave homelessness forever. Proceeds from the event directly fund ACSS’ services, which include assessment, job readiness and life skills training, career planning, case management, job placement assistance and a range of supportive services. Sponsorship packages, individual and group golfing opportunities are available! You may purchase online, or download our registration form. For more information, please contact Dana Johnson at 404-446-4682 or GolfClassic@atlantacss.org.